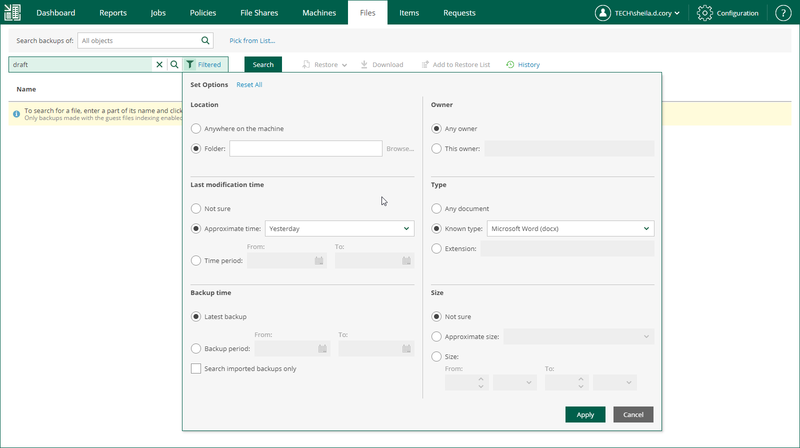 Veeam Backup Enterprise Manager allows you to search for guest OS files in all machine backups created by managed backup servers with guest indexing enabled. You can use one of two available search modes — simple or advanced. Open the Files tab and go to the Search tab. In the Machine name field, select the machine that you want to browse. In the Search field, type in the name of the necessary file or a part of it and click the search icon on the right. Open the Files tab and click the No Filter link in the search field to open the Set Options window. Location — select a specific folder on the machine to search in. Last modification time – specify approximate time when the file was last modified or set a time interval. Backup time — choose to search through the latest backup of the specified machine or all backups of the machine created within a certain time interval. Owner — select to search for files with a specific owner. Type — select to search for files of specific type or with a certain extension. Size — specify approximate size of file or set a size range. Click the search icon to the right of the Search field.